“Tagliovivo in Italian means raw cut. This concept express the identity of the brand, a combination between a rough look and a luxury product. Leather and metal are the key elements of the Tagliovivo bags.The leathers are vegetable tanned, produced by Guidi tannery and they are incredibly natural. When I say natural I mean that they saves all of the original signs and scars and this features are visible on the bags. I don’t want to reject something that was part of the animal’s life, for me is a form of respect of their life. 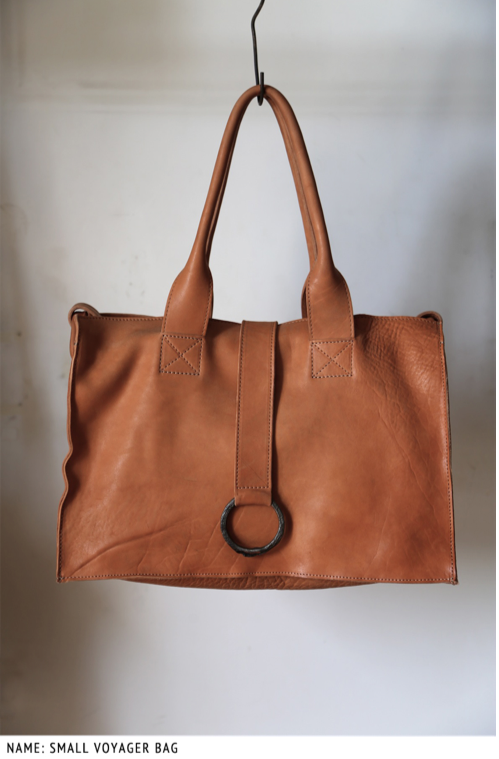 This rough leather reminds me the nature and the wild life and I want my bags as close as possible to a natural look. The second important feature of Tagliovivo’s bags is metal. Most of the buckles I use are rings which comes from ancient wrought iron chains from the second half of the nineteenth century. These chains were used in Italy to keep the pots on the fire in the fireplace. When I founded these chains I was incredibly fascinated by them and I decided to use their rings as decoration for my bags. Manufacture is made Italy by craftsmen whose experience in leather production dates back to three generations ago. Every single bag is cut by hand choosing the right part of the leather and is made to be a durable object that becomes more beautiful over time. Desert Son of Santa Fe carries Tagliovivo Handbags. Contact our shop for inquiries on our current inventory.